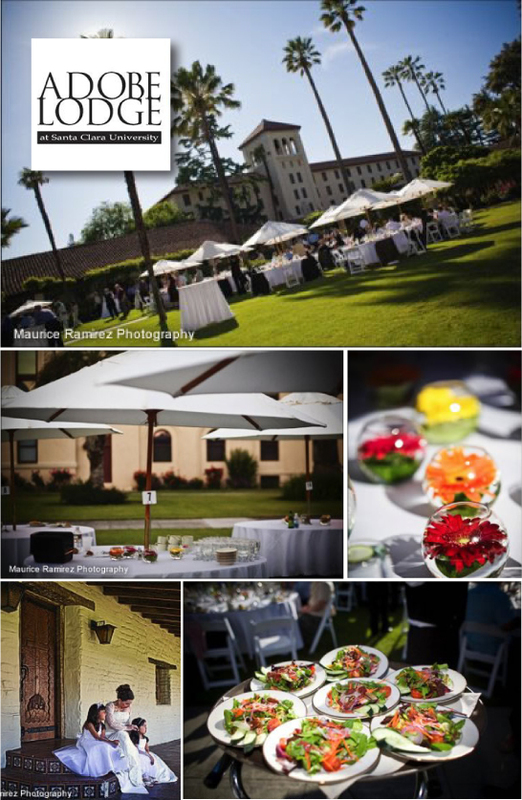 Set in the lovely Mission Gardens just steps from the historic Mission Santa Clara Church, the Adobe Lodge is the oldest structure on the Santa Clara University Campus and one of the area's most beloved event venues. Originally built in 1822, the building has been completely updated with modern amenities, but it still retains the flavor and charm of its Mission-era architecture. The Adobe Lodge and its surrounding gardens and patios are versatile spaces which easily accommodate a variety of events including engagement parties, rehearsal dinners, and other pre-ceremony celebrations or post-wedding receptions. With its convenient location, the Adobe Lodge is also a great choice for family reunions. Whether you choose to have your ceremony on or off campus, the Adobe Lodge will prove to be a beautiful and serene location to enjoy your celebrations. Our on-site event planner is happy to help with ideas and recommend vendors, and if you don't have your own wedding coordinator our event staff will provide day-of coordination. At the Adobe Lodge, you're encouraged to be creative, and use any or all of the event areas in the way that suits you best. Explore some of our more popular menu when you download our Digital Wedding Brochure. designed to assist you in event planning. However, every function is unique and we will be very happy to create a customized menu for your event, large or small.